« Wenger makes his first signings. Both are unknown one of whom is injured. For many years December was one of the busiest months in league football, and December 1913 was certainly no exception. As such it is not surprising that as we have found (in compiling the reports of the last few months of 1913) there was a decline in the activities of Henry Norris in terms of Arsenal – but he wasn’t totally inactive. He undoubtedly attended many of the games, and watched with pleasure at how his choice of venue had, as he had planned, brought about the instant re-birth of the club despite the relegation. He had agreed or in one or two cases actually arranged some transfers, and now he could focus just on keeping up the publicity and selling the shares. Indeed the new share issue of Woolwich Arsenal Football and Athletic Company had already gone through its formalities in the autumn – it was to be the first new share issue since December 1910 and thus the first since the move (until this point Henry Norris had simply been selling some of his own shares). 745 new shares were sold from 1000 on offer in December 1913 at £1 each. It might not seem much to us now, but in 1913 this was a big chunk of money. Now at this point I want to jump back to the picture Arsenal released to prove that Woolwich Arsenal played in blackcurrent coloured jerseys in the first year at Highbury – a picture used in order to launch the similar coloured shirts in the final year at the ground. This picture, it was said was taken on 6 September 1913. However as Mark Andrews pointed out in a previous article on this site this picture may not be as it seems. In this photo it has the very bald Jock Rutherford on the left hand side; also Bob Benson (who died after playing for the club in 1916) is the fair haired chap next to the goalkeeper. Charlie Lewis is sat on the far right. Now we already know from last month’s review, Jock Rutherford was not at the club in September 1913. From the players biographies in our book “Woolwich Arsenal the club that changed football” (email me at Tony@schools.co.uk if you want a copy) we note that Bob Benson’s first game for the club was away to Bristol City on 29th November 1913. Charlie Lewis did not play until October 11 in the game against Huddersfield.. Donald Slade who is sitting in the middle played his first match for Woolwich Arsenal on 13th December 1913. Thus this photo cannot be a picture taken of the team at the first game at Highbury and the earliest it could have been taken was 13th December 1913 when all four players were in the team playing away against Clapton Orient. As Mark said in his article, “By looking at all the players and matching them against the team line ups it is apparent that the photo was taken either at home on 28 Februrary 1914 against Blackpool, or away on 28 March 1914 at Birmingham. 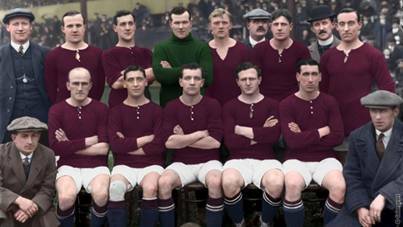 “There is a rumour that it was also not even taken in colour in 1914 but was actually a black and white photo which may have been coloured in by a marketing department around the time of the last season at Highbury, giving the blackcurrant kit some historical legitimacy. 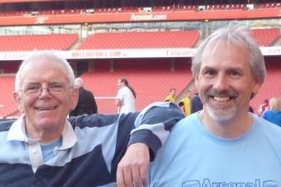 As Mark also pointed out, “certainly there was not the consistency of colour that we have nowadays and during our research we have found many occasions where both Woolwich Arsenal and Royal Arsenal did not play in exactly the kit assumed from previous histories. 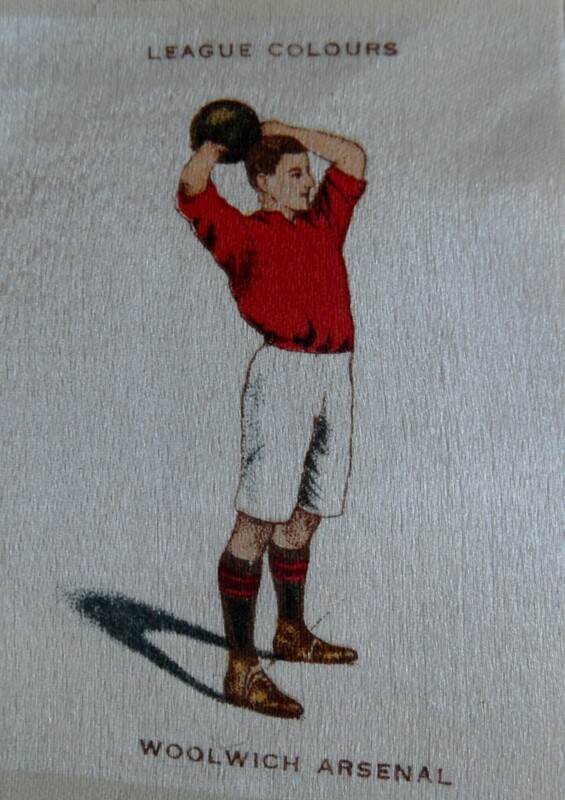 The 1914 depiction of Woolwich Arsenal colours as seen by the “League Colours” series from Godfrey Phillips shows the shirt as dark Garibaldi red, and the socks as black with red hoops. Back with the football, on 6 December 1913 the result was Arsenal 1 Leeds City 0 and this marked Herbert Chapman’s first visit to Highbury and his first meeting with Henry Norris with a crowd of 18,000 present. That Leeds City are no longer with us, was due to events that took place during the first world war when Herbert Chapman was still nominally although not actively manager – he was working as a factory manager during the first world war, with professional football suspended. Chapman had returned to Leeds in 1918 when the war concluded and resumed his work as manager, but only a few months later (and with football just consisting of friendly games – the league not resuming until August 1919) he resigned, moved to Selby and apparently gave up football totally to become a superintendent at an oil and coke works. Leeds City were subsequently reported by some former players of paying “guest” players who had appeared for them in war time friendlies – something that was outlawed. But the case on both sides was dubious. The League had no documentary proof save the say-so of the ex-players – but then there was not likely to be any such proof, as “guest” players who had been paid (if there were any) would have been paid cash and no records kept. But Leeds City would not give the League their detailed financial records, and so in the arbitrary way that it often deals with these things, the Football League after eight games in the 1919/20 season removed Leeds City from membership, and suspended five officials, for life. Their fixtures were taken over by Port Vale, who bizarrely were able to count the eight games Leeds City had played (four wins two draws and two defeats) as their own! For Herbert Chapman however matters went from bad to worse since in late December 1920 he was laid off from his job at the coke works. He was unemployed, and by then banned for life from his main mode of activity. He was however then approached by Huddersfield Town to be assistant to Ambrose Langley, who had played with Herbert Chapman’s brother Harry at The Wednesday (where Harry had made over 200 appearances). Even a five year old child playing football in the park with his eyes closed could see that the case against Herbert Chapman obviously had no basis, and after just a month’s unemployment he became an employee of Huddersfield Town on 1 February 1921, soon replacing the incumbent manager. But that of course is all for the future and I digress – let us therefore return to the Leeds City game. It seems to have a been a straightforward affair which Arsenal won 1-0. Then after that up came Arsenal’s first league match ever against their other new neighbours, Clapton Orient. Arsenal had in fact only played the Os once before – on 16 January 1911 in the FA Cup at the Clapton ground – Arsenal had won 2-1. Clapton had been having a modest middle of the table time of it of late, for in their nine games since 11 October they had lost two, won two and drawn four. Perhaps making the matter less appealing was the fact that three of the consecutive games (8, 15 and 22 November) had all been goalless draws. Subsequently they had beaten Blackpool at home and lost to Forest away. In 1912/13 Orient had had an average home crowd of 9835 (compared with Woolwich Arsenal in the final year in Plumstead where the average crowd was 9395.) Orient came 14th that season. In this season of 1913/14 with Arsenal as near neighbours their average attendance shot up by just under 32% to 12,970 (the average for the season in the second division was 10,738, itself a 23% increase on the previous year). Clapton’s improvement might in part have been because they improved their league position to sixth, but they never looked like promotion candidates, and it is most likely that this improvement came about because of the rise in local interest, following the arrival of Arsenal – exactly as Norris predicted. Certainly the locals (and indeed many Arsenal fans) wanted to be at this match, as the crowd was 27,000 at the Millfields Road ground. This however wasn’t the highest attendance at the ground ever as on 16 March 1929, by which time the ground had been changed somewhat, a game against Tottenham attracted 37,615. And Clapton may well have changed their mind about Arsenal’s move north, not just because of their improved crowds but also because they won this game 1-0. On 20 December Arsenal began the traditional mad dash through Christmas, this time with four matches in eight days. They had to play away on Christmas Day, in accordance with the lease of the ground, but that didn’t seem to make any odds as all four games were won. Here are the results. One can imagine the smile on Henry Norris’ face on seeing the second home crowd of 30,000 plus on Boxing Day. At the end of the year Arsenal were in a very respectable third position with only goal average separating them from the two clubs above. Instant promotion back to the first division looked a real possibility.